home › posts › Colchuck Lake, A Short Driv... ten trees planted for every item purchased. Colchuck Lake, A Short Drive From Seattle, Is Washington's Coolest Hike! Washington State is a nature lover's dream! This beautiful state has a plethora of hiking trails, campgrounds and parks. But, one of the most beautiful areas is Colchuck Lake. Located near Leavenworth, WA, the hiking trail to this lake can be difficult. There are switchbacks, stream crossings and boulder climbing along the trail and the final ascent to the lake is pretty steep. Camping is allowed along the shore, but you must obtain an overnight permit at the Leavenworth Ranger Station. Swimming is also allowed but, with the Colchuck Glacier not far away, the water is very cold! Dogs are prohibited. Always know before you go, leave nothing but footprints and only take pictures. We want this beautiful place to be just as beautiful after we leave as it was when we got there! 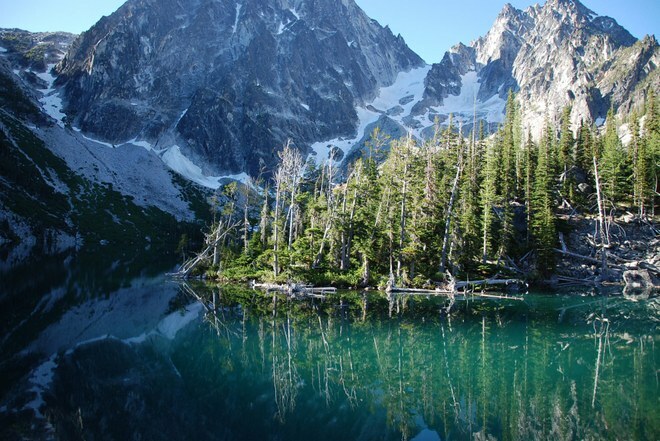 The post Colchuck Lake, A Short Drive From Seattle, Is Washington's Coolest Hike! appeared first on tentree.